When you think of Sammy Davis Jnr, one word comes inmediately to mind – energy! And energy is whant Thomas Henry brings to the stage in his uncannily accurate recreation os this legendary performer. The tap shoes become a blur as he swirls across the stage and delivers every number with the power and emotion that set Sammy Davis Jnr far apart from every other song and dance man in the bizz. Thomas Henry resurrects the entertainer`s incredible multi talented personality and he will have you grinning from ear to ear in amazement with his dynamic and unforgettable take on the legendary Sammy Davis. Thomas Henry is a singer/song write, dancer and performer in his own right and has been in the entertainment business for most of his life. After having enjoyed some success in the Purple Reign Tribute which successfully toured for 8 years in the UK, Germany and Spain and he shared the stage with such great names such as Edwin star, Grace Jones, A.B.C. and Jules Holland, to name just a few. Thomas has since traded in the Cuban heels for a pair of tap shoes and has been bringing back the magic of Sammy Davis Jnr. to audiences everywhere for the past three years. 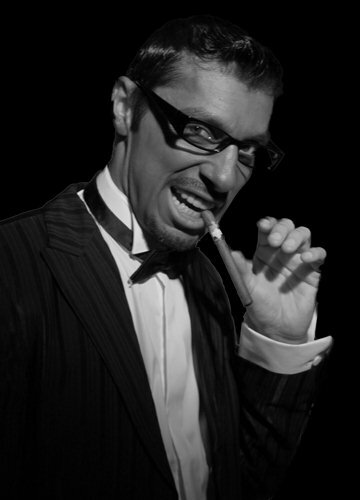 He has also worked with a number of different Rat Pack shows throughout Europe. Thomas met up with his new buddies in swing when they came together for the first time to recreate the Sands Hotel, Las Vegas in The Royal Kensington Gardens Hotel in London. It was immediately clear that the three of them gelled perfectly, giving you the feeling of being on the front row of “The Copa Room” in front of the real thing!! The Rat Pack Live was born! The third member of this dazzling crew, Thomas Henry will leave you mesmerized with his song and dance and the warmth and quality of his vocals will melt you in your seat. It you never got to see the man himself, do yourself a favour and come and see closest match to the late Sammy Davis Jnr you are ever likely to hear or see in these times!